The Cubs unveiled big plans for the Friendly Confines at a neighborhood meeting Tuesday evening. LAKEVIEW — Bigger dugouts, more restrooms, a hotel across the street, more concessions and a community area for people to gather and watch outdoor movies are part of a Wrigley Field renovation proposal being shown to neighbors of the Chicago Cubs. The Cubs' plans to upgrade the historic ballpark also include locker room renovations, a batting cage under the grandstand and improvements to luxury suites and the press box. Jennifer Dedes Nowak, the Cubs' manager of community outreach, grants and donations, presented the potential upgrades to Wrigley and the surrounding area at a meeting of the West Lake View Neighbors organization Tuesday evening. A short video showed a rendering of what the Cubs have in mind for the ballpark. The changes would be phased in over four years if approved, Dedes Nowak said. "This is a heads-up," she said, emphasizing she sought community input before final decisions. "This is what we're thinking." The plan also featured more practice space for players and a replacement for the existing roof. Development of the field's adjacent triangle property — the area west of the ballpark now occupied by a temporary ice rink and parking lots — aims to transform the spot into a neighborhood entertainment and community hub. Renderings featured an open space for farmers markets, outdoor movie screenings and a better ice rink. It would be surrounded by more Cubs office space and a one- to two-story retail plaza. The Chicago Cubs and Wrigley Field are 95 percent owned by a trust established for the benefit of the family of Joe Ricketts, owner and CEO of DNAinfo.com. Joe Ricketts has no direct involvement in the team's day-to-day operations. The Ricketts family also owns the land across from the ballpark where a McDonald's now operates. Renderings showed it housing a glass, L-shaped hotel with a courtyard facing Wrigley. A McDonald's, however, would remain on the property, though it may be rebuilt to better fit with the hotel, according to the plans. Issues such as height and parking are still in the works, Dedes Nowak said. "We're sinking money into the ballpark," she said. 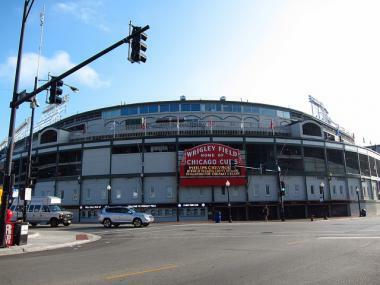 Wrigley Field is under landmark protection, and many proposed upgrades need city approval. Plans for the renovation of Wrigley Field have evolved over the years. So has the debate over the funding, with the Cubs working with elected officials on the topic of public funding for some of the stadium work. Bennett Lawson, Ald. Tom Tunney's (44th) chief of staff, said the plan has been "received fairly well." There's a demand for hotel rooms in the area, and the open space is an improvement from past renderings, he said. But they're still awaiting specifics like height of the hotel, the number of units, and parking. "The devil's in the details," he said. "Eventually we'll get to something that's workable." Official photos of the renderings will be presented Jan. 19, said Julian Green, vice president of communication and community affairs for the Cubs.